Check out our full review of the Motorola Moto X smart phone. 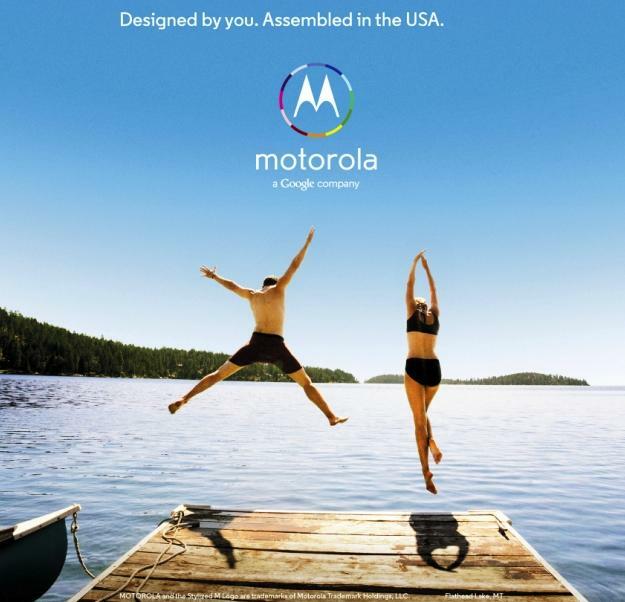 The first teaser advert for the Motorola Moto X has been published online by AdAge.com, ahead of its print debut in several major newspapers, such as The Wall Street Journal, USA Today, the Washington Post, and The New York Times. Apparently, the full-page advert will run in today’s, July 3, editions. Sadly, we haven’t been given a look at the phone, and instead the copy is accompanied by a picture of two people leaping into a lake, one of whom is doing a star jump so he looks like the letter X, while his companion holds a straight form, perhaps like the number one. Motorola and its ad agency have decided to take a wholly patriotic approach to promoting the Moto X at this early stage. 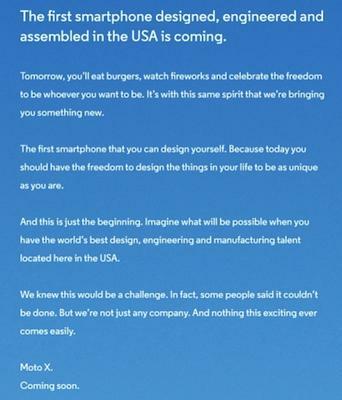 It starts by saying it’s, “The first smartphone designed, engineered and assembled in the USA,” then goes on to talk about Independence Day celebrations, and how the phone has been created in, “The same spirit.” We’ve known since the end of May that Motorola would be assembling Moto X phones in Fort Worth, Texas; at least those destined for U.S. buyers anyway. Flag-waving aside, the ad copy does confirm one aspect of the actual Moto X, as it’s set to be, “The first smartphone that you can design yourself.” Talk of the Moto X being customizable has been around since rumors of the phone first began, with everything from the color of the body to a choice of pre-installed wallpaper and apps, and the amount of RAM to the size of the battery being potential features which could be specified by the buyer at the time of purchase. The “Assembled in the USA” tagline and the customizable nature of the phone are tightly connected, as it would be a logistical nightmare to send complex orders to a factory halfway around the world, where everything is geared around the same device being built in quick succession. Domestic assembly is what makes the customizable Moto X possible. However, what it doesn’t do, is bode well for international customers. If the Moto X is put on sale through Google Play in Europe or elsewhere, it may not have the same options as the one available in America. Ever since it adopted Android, Motorola’s international release schedules have been haphazard at best, and that may not alter under Google’s ownership. Motorola closes the advert by saying the Moto X is coming soon, but doesn’t provide a date. While it’s playing coy here, Motorola’s CEO did no such thing earlier this month, when he said we should expect the phone to be released in October.